Hi Readers. Today I chat with fellow Melbournite, Rebecca Taylor. Bec comes from Mt Eliza, a suburb on the east-side of Melbourne. Welcome Bec. Please tell our readers something about yourself. I am 39 years old, but most days feel 50! I live in a spectacular part of Victoria, Mt Eliza and am 5 minutes walk from a beach that I never see as I am always doing washing. I live across the road from a water reservoir that I am currently trying to save from being dug up for high density housing, which is why I moved away from Pakenham in the first place. I much prefer the sight of gumtrees filled with kookaburras, parrots and Tawny Frog Mouths and hearing the call of frogs compared to the call of workmen. I am rearing 4 children who are becoming far too independent thinking for my liking and have an immigrant for a husband (does a Cockney count?). Thanks to my aspirationalist, middle class upbringing in the Latrobe Valley in a town that shall not be named (Moe), it is easier to say where I haven’t traveled in a Jayco Swan than where I have been. I also am the product of a successful public school and HECS derived education system. I graduated from Monash University twice. The first as a Major in History/Politics (yes I could put BA after my name – but choose not to), the second time as a Secondary History Teacher (no I didn’t learn!). In between those two degrees I was a Sales Rep for the Mars Corporation where I ate far too many Twix and then an Electorate Officer and all round babysitter for 2 Federal Politicians. Travel wise I have taken the wrong train to Pompeii and discovered Herculaneum instead, appreciated Muslim architecture in Granada, ate Pigeon Pie in Morocco, paid respects to newly interred Australian soldiers in Fromelles while drinking bad beer with ABC journalists, been late for the Battle of Hastings and in time to catch the Disney Train in Orlando! My favorite hobbies are pollinating my melons, the inexhaustible amusement that is de-cluttering, sharing inappropriate political paraphernalia on Facebook and sorting whites from colors. The lure of the siren call of a 2 year old that has just poo’d his pants at 6am! 🙂 That, and the fact that it is a new day and I might actually get to steal 2 seconds to write one or two words of prose. After searching for lost socks of course! I have two. Martha Stewart, so she can show me how to store multi-coloured Lego whilst keeping the Hamptons feel of my Cape Cod inspired living room. Also Oprah Winfrey, so that she can shamelessly plug my book so that I can earn millions instantly to pay for my New England renovation … in New England!!! 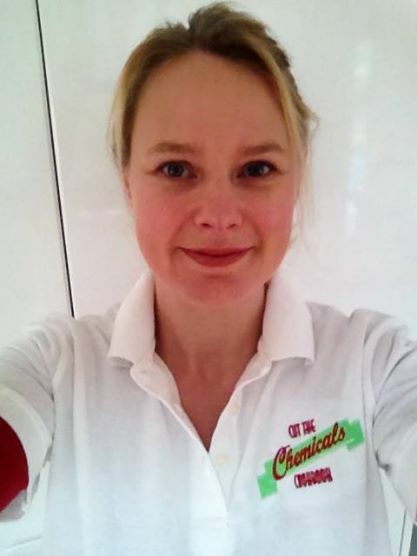 What’s the story behind your upcoming release, “Cut The Chemicals Cookbook”? My daughter displayed intolerances to foods that contained artificial additives like colours, flavours and preservatives. After some research we modified her diet and she is now a changed child. Literally – we traded her in for a nicer one. Seriously, the whole family has benefited. I got sick of other sticky nose families asking me about how we did it and why so I wrote the book. I found that while doing research it seemed as though the information was difficult to understand and that you had to buy expensive ingredients and information packages to make changes. I wanted to show families actually how easy it was to do and how you can change your families diet in a way that was easy for busy working families and budget friendly too. I am a repressed Tony Robins and love all things History. I am extremely envious of the person who wrote Horrible Histories and the teacher in me hopes to one day also educate children about the wonders of the past without them realising that they are learning. My current project is a series of books aimed at my son’s age group (10 years) and bears his name. It’s called Out of Time Oscar. Oscar must save his famous Archaeologist Uncle from a fate worse than death, to be left to live out his days trapped in a past that has no internet! This series sees Oscar in each book hurled on a misadventure through a particular period in time, where he must solve a problem to rectify the fabric of time that has been damaged by his time traveling uncle. If he doesn’t get the job done in time (i.e. by the end of chapter 10) there will be serious repercussions for all humanity and his uncle will be trapped forever (cue menacing drum beat). I also have started a series of books that are historical fiction for teenagers. I have based the stories on real life Australian historical figures. The first book was about Eva Carmichael, one of the only survivors of the Loch Ard shipwreck in the 1800’s off the Great Ocean Road. My next book is going to be about my two Great Uncles who were among the first Australians to battle the Japanese in WW2 whilst trying to save Singapore from invasion. This is currently in the research phase. I can make a meal out of 3 random wilted ingredients, whilst – wait for it – marking homework, making lunches, dressing up 2 years olds as Batman, avoiding questions about what’s for dinner all while brandishing a menacing whisk at inept politicians on 774 ABC drive radio! Who are your favorite authors and singers? I am a product of the 90’s Seattle Grunge scene, so I still think that Eddie Vedder understands my adolescent angst. I also still live in hope at the reformation of Powderfinger after Bernard Fanning grows tired of Siestas. As I am a multi-faceted individual who doesn’t conform to stereotypes I also love Jane Austen (for my romantic side), Kylie (for the disco queen in me), Dan Brown (History Revisionist) and Jackie French (I’m a Proper Grown up). I also love Terry Deary whose brilliance I would love to emulate, Enid Blyton for her quaint English cottage culture and J.K Rowling for keeping my 10 year old off the iPad. Thanks Bec for being my guest today. 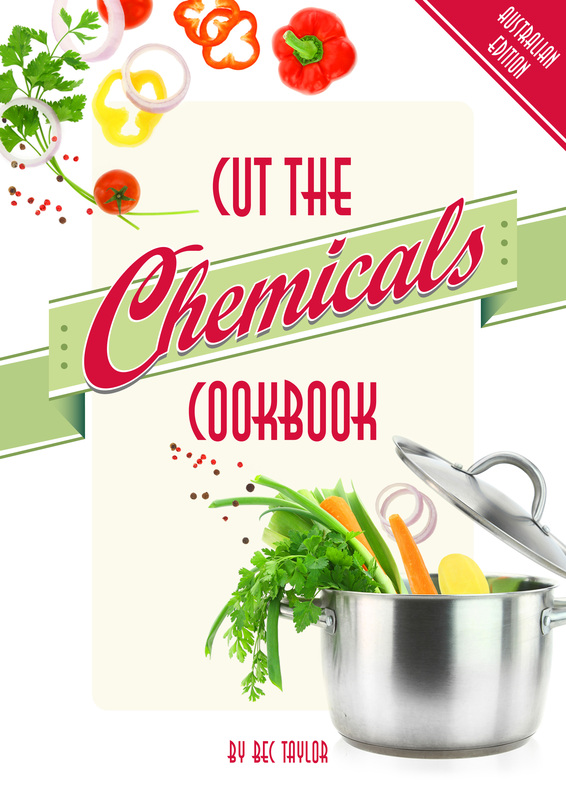 Cut The Chemicals Cookbook is coming soon from ASJ Publishing.